My first love, as a young boy — long before the discovery of women, or travel, or biking or stand-up paddle boarding — was baseball. I developed this passion on my own. That’s because the house where I grew up sat at the end of a dirt road, miles from the nearest village, so I had no one else my age to play with. I solved this problem by spending hour upon hour throwing a baseball against the door of my father’s tool shed, fielding the errant rebounds like a catcher pouncing for breaking balls in the dirt. Some afternoons, my father and I would play catch in the yard. Each toss of the ball and smack of the mitt an intimate conversation. Once a summer, my father and I (and sometimes another father and son) would embark on what we called our annual baseball pilgrimage — a road trip to Chicago or Detroit to take in a Major League ballgame, often followed by a theater play or an ethnic meal in Greektown or Little Italy — cultural opportunities that didn’t exist in rural Northern Michigan. These trips built our father-son bond, and they taught me about history and tradition. The way the cool of spring stings a batter’s hands when he connects on an inside fastball; the way the heat of summer and its muggy air increases the number of home runs, and the way autumn and its World Series thrills offer the perfect prelude to quiet winter. 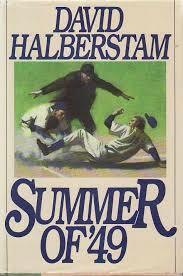 As a teenager, I fell in love with baseball literature, too. On days at the beach in the Sleeping Bear Dunes, or on family road trips to Florida or Arizona, I would eat up the pages of the great baseball books: W.P. Kinsella’s classics The Iowa Baseball Confederacy and Shoeless Joe, Bernard Malamud’s The Natural, David Halberstam’s Summer of ‘49, and Chaim Potok’s The Chosen. Later, Chad Harbach’s The Art of Fielding entered my library, and this past winter, I devoured Kinsella’s magical realism novel Butterfly Winter, a Gabriel Garcia Marquez-like jaunt through baseball lore and Latin American fables. Now I’m a father to a gorgeous little girl who, I hope, will grow up loving baseball and appreciating its place in the American cultural and literary landscape. I was born loving baseball. Genetics! My great grandmother Edna Weitz Johnson made frequent journal entries about the Detroit Tigers and the Chicago Cubs. She also listened to games on the radio while the men worked in the field, keeping score well enough to relay the results in play-by-play fashion at the end of the workday. Edna, her husband, children and grandchildren (including my grandfather and father) made trips from western Michigan — before highways and fast cars — to Detroit to see the Tigers play. The men wore fedoras and suit coats and the women wore dresses. I am the first generation of the Johnson family to not attend a one-room schoolhouse. The generations before me played baseball on the school grounds. 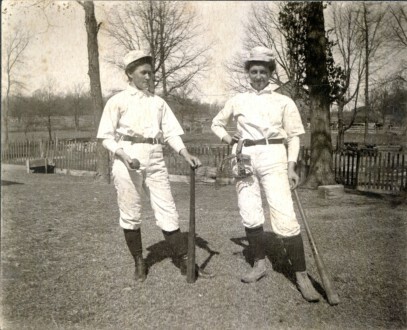 When they were older, they played organized baseball for the small towns in which they lived. I have a copy of a passionate letter written by one family member to officials in towns within geographic proximity urging them to form a league. For my predecessors, baseball was a necessary entertainment and recreation. My father taught me how to swing a bat and how to keep score. He taught me the names of Detroit Tigers like Cobb, Crawford, and Colavito. Kell, Greenberg and Gehringer. Schoolboy Rowe, Hal Newhouser and Mickey Cochrane. Lolich and Northrup and Cash and Horton. And, his all-time favorite, Rudy York. Growing up, my love of reading equaled my love of baseball. While in high school, I began a collection of baseball books. Essays. Anthologies. Poems. Novels. Biographies. Bang the Drum Slowly, by Mark Harris and the Iowa Baseball Confederacy by W.P. Kinsella top my list of favorite baseball novels. An essay entitled The Green Fields of the Mind by A. Bartlett Giamatti, and a poem, To Bill Lee, by Tom Clark (who edited the poetry section of the Paris Review for ten years) are among some of my other favorite writings on the splendid sport. However, a collection of baseball writing by women is closest to my heart. It has been nearly 20 years since I purchased my first copy of Diamonds Are a Girl’s Best Friend: Women Writers on Baseball by Elinor Nauen. It features sixty-six contributors including Annie Dillard, Ann Hood, Shirley Jackson, Marianne Moore, and Anna Quindlen. The anthology is a moving collection of outstanding writing for baseball fans—female and male. In this book, the four-stanza poem, What Baseball Tells Us About Love, by the relatively unknown Linda Kittell, is where my worn-out copy falls open. Being recently engaged when I first read the poem, it touched all of the right bases. he played only for the Yankees. In sickness and health, Eleanor Gehrig loved her husband. It just made sense to have the poem read at our wedding. Now, nearly twenty years later, just like the poem concludes, our love is even better than when it was new. than when it was new. While researching this poem, I came across an obituary for Linda Kittell. The announcement of her death, dated January 29, 2014, began with a selection from one of her own poems. no sign from the dugout: You’re just finished. you ought to go out on. Although I had never met her, I felt as if I had lost an old friend. After all, she was a part of my wedding — forever entwined with my life. I wished that I had found a way to tell her what her words had meant to me. I hoped that she somehow just knew.